NCC alumnus and MEP for the North West Sajjad Karim enjoyed a trip down memory lane when he returned to college to film part of a documentary on his life. Sajjad attended Nelson and Colne College in the mid-1980s when he studied Business Studies, History and Government and Politics before progressing on to the College of Law in Chester. He returned to NCC as part of the segment on his early life that Pakistan TV, the country’s equivalent of the BBC, is filming for a documentary. 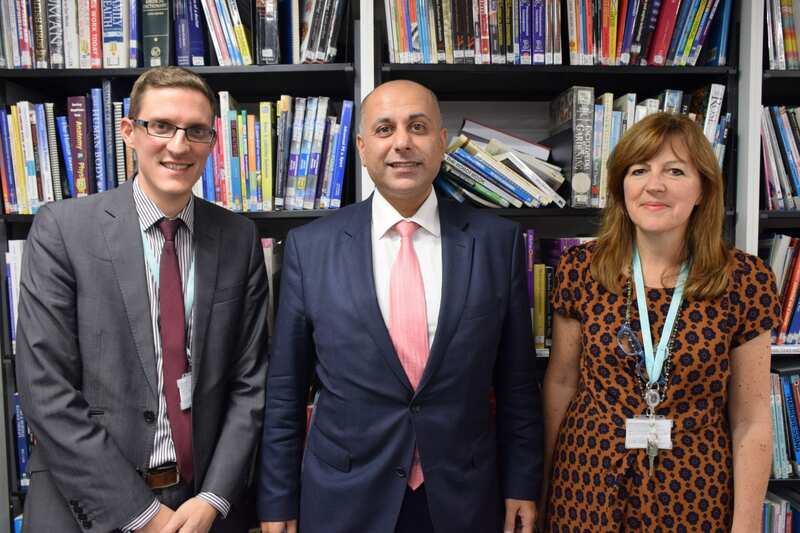 While back at college, Sajjad met Principal Amanda Melton and Vice Principal Paul Britton for tea in the Learning Resource Centre. He also enjoyed a tour of the £2million Engineering facilities where he met tutor Waqar Naweed, before heading back to where it all started in the Humanities department, where he chatted to staff and students in a Business class. Reflecting on his visit, Sajjad said: “Nelson and Colne College really helped me to focus on what I wanted to do and provided me with that avenue to achieve what was necessary. “It is the best performing college in the UK for learner achievement and it makes me incredibly pleased and proud to be associated with an institution of this sort – the facilities available here are fantastic and the students are quite clearly taking full advantage of the phenomenal opportunities available to them. Principal of Nelson and Colne College Amanda Melton said: “It was an absolute pleasure to meet with Sajjad again and show him around the college 30 years after he attended here himself. “The facilities at NCC have changed greatly in that time but one thing that has not changed is our commitment to providing the very best education for our students. It was heart-warming to hear Sajjad’s story and how the college helped him progress into Law and then into Politics. In its latest set of results, NCC achieved a 99.7% pass rate at A Level and a 100% pass rate in vocational courses. In the summer, the college was named as the top college in the country for learner achievement at all ages and levels and second in the country for its 16-18 Apprenticeship success. Government data also places NCC as the best college in Lancashire for A Levels and the top college in the area for vocational courses, based on progress scores, while it is also the best college in Lancashire for student satisfaction, according to the FE Choices Learner Satisfaction Survey.